(May 4, 2017) The Hillsborough County Aviation Authority Board of Directors on Thursday approved a $132.4 million budget amendment allowing initial work to begin on Phase 2 of the Master Plan later this year. 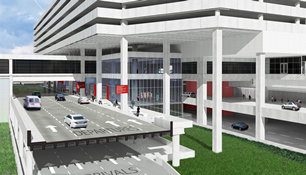 The amendment enables Tampa International Airport to demolish the red side garage and former Airside D guideway, which clears the way for future curbside expansion, and to begin development of a 17-acre commercial area around the newly built consolidated rental car center. Phase 2, which costs $543 million, features a commercial development area will include an office building, convenience store with gas station, hotels, a commercial curb to accommodate transit and other ground transportation, as well as connections to regional trail networks. The curbside expansion includes new express lanes exclusively for passengers without checked luggage, a customer service upgrade that builds on Tampa International’s legacy of innovation. The Board will consider the remaining elements of TPA’s Phase 2 expansion later this year as part of the Aviation Authority’s FY2018 capital budget. With Board approval, site preparation on the commercial development is slated to begin in mid-2018. Curbside construction is scheduled to begin in late 2019 and end in 2023. TPA officials began preparing for Phase 2 in 2016 with a re-examination of its original Master Plan. This analysis validated passenger forecasts, identified opportunities for cost savings and resulted in a refined plan with adjusted phasing for some program elements. Removed after re-evaluation: A Main Terminal expansion with a consolidated security screening checkpoint. This achieves cost savings by keeping the in-airport Marriott hotel and air traffic control tower in place, and supports swift security screening by maintaining dispersed checkpoints. A new Airside D with 16 gates capable of handling both domestic and international flights, and international passenger processing facilities remain part of Phase 3, which is scheduled to begin sometime after 2020. Airport officials presented Board members with the newly revised plan for Phase 2 at a workshop in April. The Authority then rolled out the plans in public meetings in Hillsborough, Pinellas and Pasco counties, and at an Open House on April 27. The projects are part of a three-phase plan that will allow the airport to serve 34 million passengers annually – nearly double the current passenger volume – while remaining in the airport’s existing footprint. HCAA Board members on Thursday also adopted the Airport’s 2017 Strategic Business Plan. The plan provides a detailed financial outlook for the airport through 2025, as well as a proposal for annual capital program funding through 2037.